The diagnosis of polyneuropathy, organomegaly, endocrinopathy, M protein, and skin changes (POEMS) syndrome requires polyneuropathy and monoclonal plasma cell proliferation as two mandatory criteria. Our aim was to summarize clinical manifestations and treatment responses of POEMS variants with no evidence of monoclonal gammopathy. 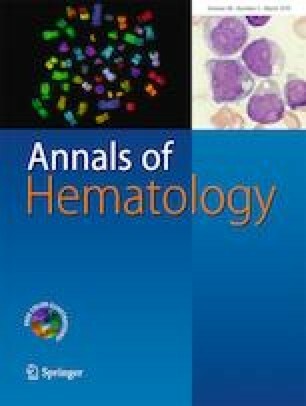 We queried all medical documentation of patients referred to Peking Union Medical College Hospital from August 2012 to July 2017, and reviewed the clinical and laboratory features of 13 patients with atypical POEMS syndrome with undetectable monoclonal gammopathy, and compared to prototypes published. The prevalence of polyneuropathy, organomegaly, skin changes, and extravascular fluid overload were 100%, 100%, 92%, and 100%, respectively. Other clinical manifestations, such as endocrinopathy, pulmonary hypertension, papilledema, thrombocytosis, and polycythemia affected similar percentages of patients as seen in prototypes. POEMS variants enrolled had a median serum vascular endothelial growth factor (VEGF) level of 4998 pg/ml (range 2155–11,029 pg/ml). Long-term follow-up found that all 12 patients received autologous stem cell transplant, melphalan-based therapy or lenalidomide/thalidomide-based therapy obtained clinical improvement, of which eight experienced decreased levels of VEGF by 50% or back to normal. The median progression-free survival was 101.5 months. Our findings raised a variant of POEMS syndrome variants with featured clinical manifestations, elevated VEGF levels, and good response to therapies targeting plasma cell. We thank all patients and their families. We also thank Lijia Cui for technical support on statistical analysis, and Sarah Cui for polishing the written English language. This study was funded by National Natural Science Foundation of China (Grant No. 81570195), Peking Union Medical College New Star (2011, to LJ), the CAMS Innovation Fund for Medical Sciences (Grant/Award Number: 2016-12M-1-002), and the National Key Research and Development Program of China (Grant/Award Number: 2016YFC0901503).